Project Magnet was a Canadian Government sanctioned UFO research project that took place between December 2, 1950 and August 10, 1954 on the recommendation of Wilbert B. Smith, a scientist with a masters degree in electrical engineering. The project was sanctioned by the Deputy Minister of Transport, Commander C.P. Edwards and sightings were reported to the Department of Transport for analysis. Smith reported that he believed flying saucers are of extraterrestrial origin and use technology far in advance of human invention, possibly based upon yet undiscovered magnetic principles. 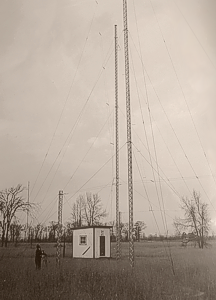 During 1953, UFO detecting equipment including a gravimeter, magnetometer, gamma ray counter and radio receiver were set up near Ottawa at Shirley's Bay. At 3.01 p.m. on August 8, 1954, the Shirley's Bay instruments recorded anomalous gravimetric readings, but visibility was impaired by fog, so no visual confirmation could be made. Project Magnet was terminated on August 10, only two days later. However Smith was granted use of the Shirley's Bay facilities in an unofficial capacity and he continued to used them for several years. The files from Project Magnet were originally classified as secret.